We’re governed almost entirely by emotion (whether you know it or not). And our psychology determines our ultimate performance. How we feel greatly determines our performance. Emotion is the root of all of this. Emotion doesn’t just drive performance individually, it also drives us collectively. Emotion is what drives economic and market cycles. They are driven entirely on emotion. Wherever there are humans, emotion is running the show. The problem is, however, what you need to stimulate emotion is EMOTION. The needed solution is also the problem. And if you need it, it means you don’t have it, that’s the ultimate Catch 22. Lack of emotion, lack of momentum, is called inertia. Inertia is the state we’re always fighting against. inactivity; sluggishness. It can also be called complacency, idleness and apathy. Essentially, inertia is emotional death to the achiever. on the natural rhythms of the seasons. achievement from a team of people, these emotional seasons are critical for you to know and manage through. associated with joy, passion, and reawakening. It’s easy and natural to be motivated, engaged and productive during the spring. Much of that momentum hits a summer doldrums wall and grinds to a lull. If you feel like right now, you still have a case of summertime ADD, you’re not alone! Check out Darren Hardy’s Summer Search Teleconference. Everything Season”), when the growth energy of spring and summer ends and literally begins to fall. is happening unconsciously, by the way. It is part of the natural rhythm of the seasons. But autumn and the fall is also the time for harvest. In our opinion, the 4th quarter is often the most important of all. your harvest, if acted upon correctly. of the fall and that is ruinous to being able to achieve their big goals for the year. upon by an external force. This is why we held our last Marketing Bootcamp at the beginning of September. Sorry if you missed it. As a leader, you are responsible for driving performance. harvest, as a leader, this is when you need to bring in Newton’s external force. need it. An external event that can rejuvenate the emotional energy of the team. new again. That is what you, and your team, needs, to rejuvenate. focus, and the methodologies of personal productivity and performance as they relate to your marketing efforts. Whether you think you need it or not, we’re telling you: You Do. you want to interrupt your natural emotional inertia through external influences. 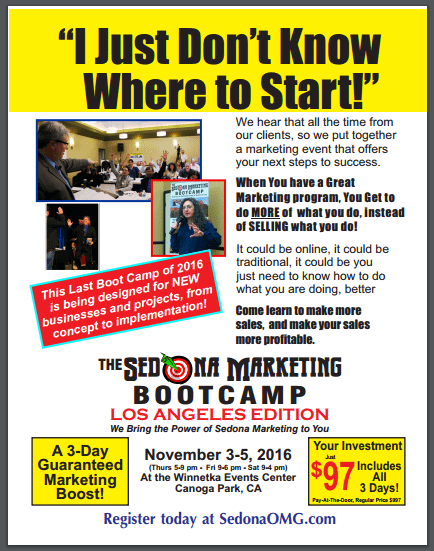 of the cost to attend our LA Marketing Bootcamp. to be acted upon by an external force. Even we need this; so just imagine what you and your people need. and fired up together, you can multiply the harvest that you can reap before the end of Sweet 16. We hope to meet you and your team at 5p on November 03rd, 2016.